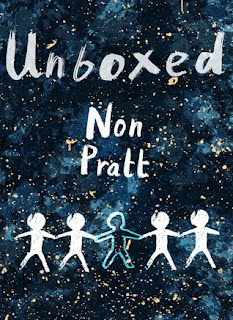 A devastating little novella from the queen of kitchen sink teen drama, Non Pratt. I've loved both of Non's full length novels for their wit and warmth, and for the fantastic way she writes friendship and dialogue. Naturally, Unboxed was no different. Narrated by Alix, the plot follows four friends as they face the prospect of an awkward reunion in their one time hometown- they are retrieving their buried time capsule from the school's roof. Having drifted apart over the last 5 years, each going off and doing their own thing, nobody is sure if the others will show. The reunion follows the death of Millie, the sweet, happy girl that held them all together. She was the one who made her surviving friends promise that they'd meet up- promise that they'd reunite. After the stilted greetings and small talk and the clumsy retrieval of the box, we begin to see the friends relax into each other's company a bit more. As they go through the carefully selected memories that each of them chose to preserve, the four reflect on how much they have changed over the five years. They examine their motives for allowing their friendships to crumble. For Alix, it's guilt that she was never able to come out to her best friends. First fearing rejection, then consumed by guilt for not trusting them, she found it easier to drift away. I really loved this story and was amazed at how much emotion and feeling can be squeezed into such a small book. Who has never looked at a photo of their schooltime squad and lamented "we all used to be so close and I haven't spoken to any of these for years- what happened?" maybe not at 18....but definitely somewhere along the way. I love how Alix voices her insecurities about how people change- relationships change, what people need from and are able to provide for each other changes. Out expectations change. Our priorities and values; guess what? They change too. It was really satisfying to see a mismatched group of kids- kids that didn't seem like they ever would have been friends at all, be truly honest with each other in a way that requires the sort of maturity and self awareness that you just don't have at 13. It seems unlikely that as story that begins with a nightmare social situation; a person surrounded by ex friends they've outgrown could possibly end with four renewed friendships, cracked, but healed stronger than before. Like bones. And all the way through, the tragic absence of Millie, the missing piece, the one who orchestrated the whole thing from beyond the grave, hangs sadly over the whole thing. Gorgeous and touching and utterly, utterly real. I genuinely do not know how she does it.